The Dogpound wave has shown up in Smyths, too - saw at least 3 of 'em, almost a quarter of the whole aisle is TMNT stuff. Got all 4 turtles, shredder and krang this suinday for 5pound each at asda. Was not going to collect this line but could not refuse for that price. They are really great figure too was surprised. Guys, Shredder is £4.99 on amazon shipped at that cost. The turtles are £7.49, each, just got my Don and Mike ordered, may jump on the shredder aswell. Ooze figures popping up on Amazon UK. Cool, little op so ill wait and see if they drop. Thanks for the heads up. OK, I'm not using UK sites, but I'm British, so I'll chip in. The prices on line here have stabilized at around 8-9 quid with negligible postal charges. I looked at one site yesterday that was carrying the entire range at those prices. I was paying nearly double when they first hit the US stores, as I know that postage from the US was incorporated into the price. It looks like it won't be long before they will be in our TRU stores and Carrefour stores. Maybe even Wallmart. Postage rates in the UK have gone up too. It costs less to send a poster to Australia than it does within our own country. Its ridiculous! £7.80 for postage is steep, but I am guessing the amazon merchant selling Ooze figures is using Royal Mail. Even then, medium parcel rates are £6.75 (recorded). The Ooze figures will probably retail for a little more when widespread anyway. Flinger and Ooze Turtles now listed on The Entertainer. Saw the flingers and ooze figures in both Toys R Us and Smyths today, and picked up Fishface from Tesco for 7.49. All the first wave figures in Tesco are that price atm, cept for Foot Ninja. saw the new flingerz wave at tescos today at £15. i thought they'd be around basic size but they're quite bigger than i expected which was quite a nice surprise. i left them on the shelf though but might grab some when price is reduced. Has there been any word on how well the toys are selling over here? Obviously Tesco in particular has quite a few of the items discounted. This wouldn't worry me too much except they were already doing it only a few weeks after the first wave was released. I live in a small town but should I be worried about the figures or is it actually doing well in the UK? Also saw the Fishface wave in Tesco earlier, £7.50 each. anyhoo, any of you guys know when/if we'll be seeing snakeweed, baxter and leatherhead here at retail? i think i read somewhere amazon have them by end of june. does that mean retail as well? Ooze Turtles now £7.50 in Tesco. Talk about glorified pre-order . I've been notified my stuff won't arrive until between late July and sometime in August. I still believe we may get these before the US though. Much cheaper either way than importing. 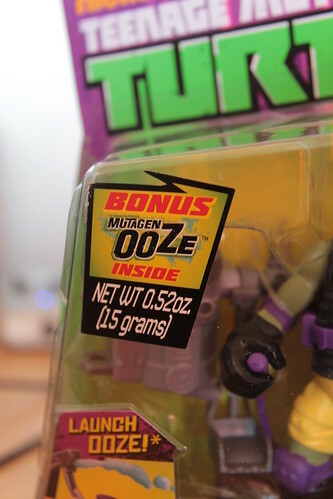 UK released Ooze Turtles now have a little extra sachet of slime included.